For reasons that remain unclear is set in the 90s in Rome. The young and charming Hollywood screenwriter Patrick (Simon Haynes) and Conrad (Cory Peterson), a middle-aged Roman Catholic priest meet in the streets of the Eternal City. They go to lunch and strike up a rapport; Patrick invites Conrad back to his hotel room for drinks. A long conversation follows, with an unexpected twist. It is beautiful to see a play where, as the story unravels, you get to know the characters through a clever, structured and intense conversation. And this is the beauty of this play, directed by Jessica Lazar: despite not much happens, the witty and subtle dialogues create a dark atmosphere that keeps the audience on the edge of their seats, guessing the truth and what is really happening. 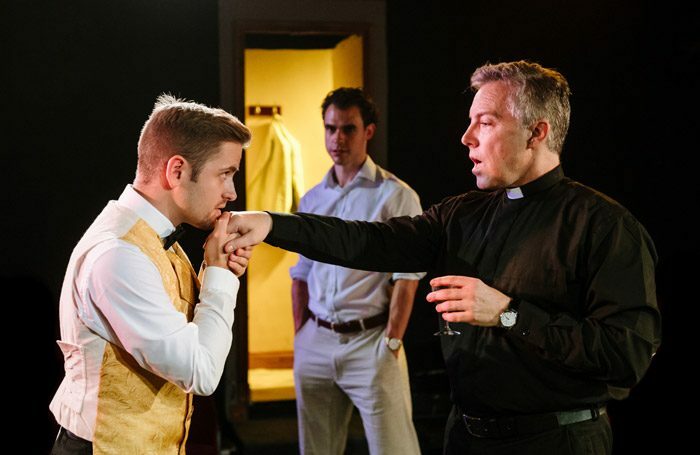 The great thing about fringe theatre – like this one – is that it is easy to get absorbed if the quality of the script matches the tense acting. And Simon and Corey, on stage for 90 minutes – do a really great job, showing realistically their emotions going deeper and deeper . It is also very important how this play reflects on the effects of trauma and abuse, and on the power of forgiveness. Highly recommended.